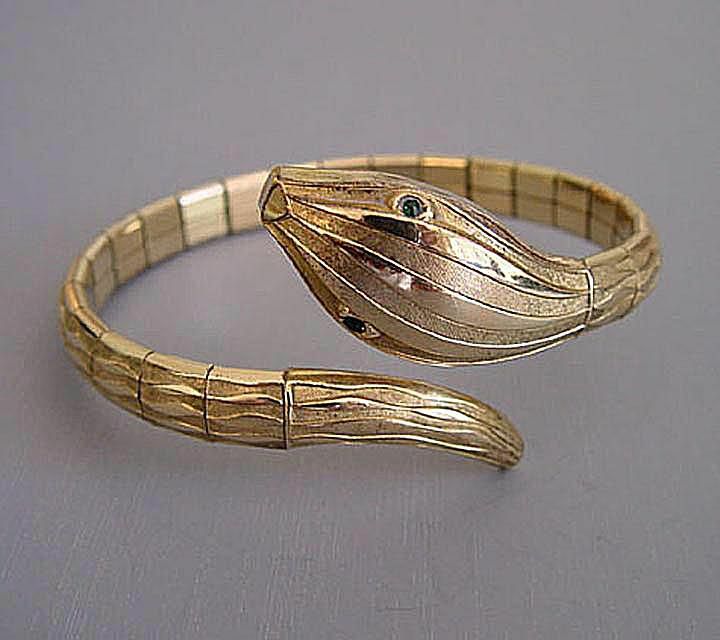 Rolled Gold Snake Bracelet by Andreas Daub, Germany. Rolled gold is a hybrid material, consisting of a thin layer of gold that's mechanically bonded or heat-fused to one or both sides of a base metal (often brass or copper), then rolled out into sheets to create jewelry. The thickness of the gold layer can vary but is generally at least five percent of the total metal weight (vs. gold-plated, which uses a thinner sheet of gold). Unlike other costume jewelry metals, rolled gold is hypoallergenic and should not cause a problem for anyone with skin sensitivities to other or mixed metals. This type of layered gold was patented in England in 1817 and it became a prime source for semi-precious and better-quality costume jewelry in the Victorian era. Using rolled gold allowed jewelry designers to create and sell intricate pieces without the high cost of solid gold. Rolled gold saw a renewed surge of popularity in the 1920s and 1930s, especially in utilitarian objects such as watches and fountain pens. Earlier English and American 19th-century rolled gold articles might be stamped with the word "Gilt." Designations such as "1/20 12K G.F." or "1/20 12K RG" indicate a later, 20th-century piece of jewelry or accessory. If a piece of gold jewelry has a mark like that, it means that the item is made of 1/20 rolled gold and is made of 12 karat gold. Modern rolled gold jewelry should always have a stamp that will indicate how much gold is used and the level of purity. Often times the letters "RG" indicate that the metal used is rolled gold. Sometimes pieces have "RGP" instead, meaning "rolled gold plate." Rolled gold jewelry is much less common than gold plated jewelry. There are major differences between the two. Gold plated jewelry is made by creating jewelry out of a base metal, usually silver or copper, and then applying a very thin layer of gold over the base metal. The application is done via a chemical or electroplating process. Since gold plating uses very little solid gold, it is less durable and cheaper than rolled gold. The gold plating can wear or flake off, causing an uneven look when it exposes the base metal beneath the gold. It is often times not hypoallergenic. Rolled gold has about 100 times more gold than gold plated jewelry. The thicker layer of gold in rolled gold prevents it from ever wearing off. If properly cared for, rolled gold jewelry can last for a very long time. Prevent exposing the rolled gold pieces to chemicals, cleaners, chlorine from pools, makeup, and perfume. Rolled gold jewelry should not be worn every day without removing it prior to bathing, washing, or other activities. Clean rolled gold with a soft cleaning cloth and warm, soapy water. A gentle bristled brush is useful if your jewelry has an intricate design or hard to reach areas. Make sure to rinse and dry the jewelry thoroughly before storing it. A jewelry polishing cloth can be used occasionally to buff your item and maintain its shine. Is What You Have Mourning Jewelry or Memento Mori? What Is Provenance in Antiques? What Makes a Piece of Jewelry Art Deco? Have You Ever Seen a Tally of Tansu?